In 3- to 3 1/2-quart slow cooker, mix all ingredients except flour, water and potatoes. In small bowl, mix flour and water; stir into beef mixture. Increase heat setting to High. Cover; cook 15 to 20 minutes or until thickened. Meanwhile, pierce potatoes all over with fork. In microwave oven, arrange potatoes in spoke pattern with narrow ends in center. Microwave 12 to 14 minutes, turning once, until tender. Cover; let stand 5 minutes. Split cooked potatoes; mash slightly with fork. Spoon beef and mushroom mixture over potatoes. Potatoes vary in size. The microwave cook time for these potatoes is based on medium potatoes. 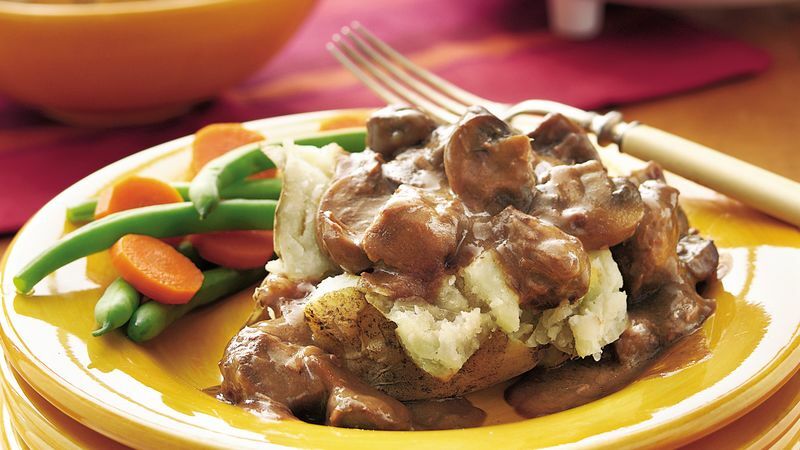 If you prefer, you could also serve the beef and mushrooms over your favorite Betty Crocker® mashed potato mix.